Single User Operated - The TASMANIAN DIGGER is designed to be used by one person, if necessary and is as highly mobile as the vehicle on which it is mounted. Danuser Auger – Hydraulically Powered Boom - The digger boom can be raised, lowered, rotated and extended in and or out utilizing the truck engine mounted or PTO mounted hydraulic pump system. 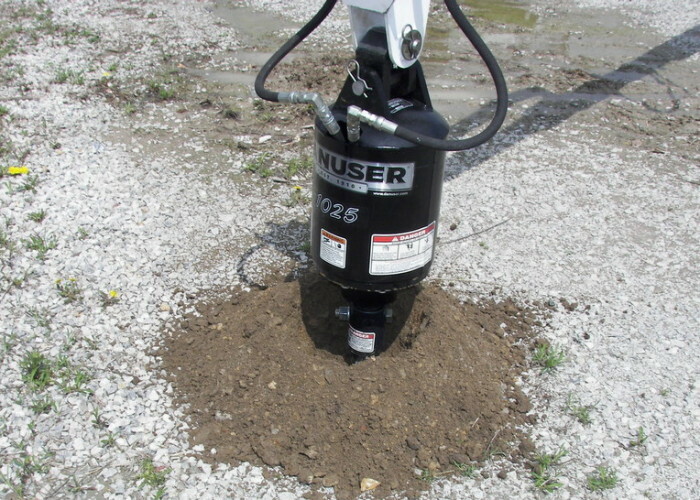 Post Driver - The Tasmanian Digger is used with a post driver to drive a post in over 12” of packed gravel. Note the one man operation of driving a Telspar steel post with our remote control push button option allowing him to maintain the post in plumb condition while driving it. 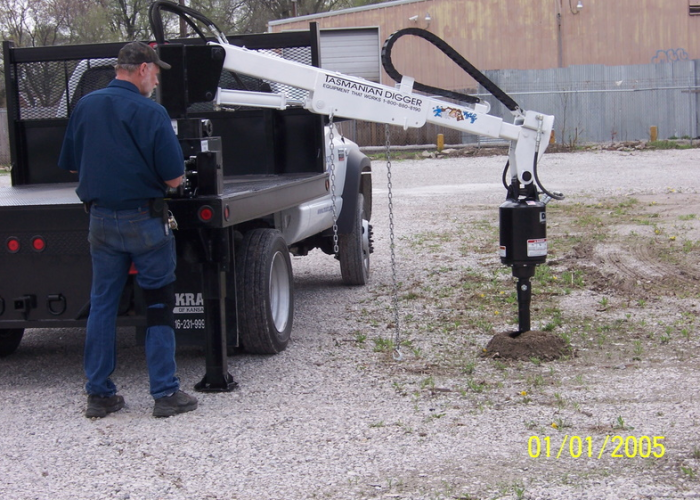 Post Puller - The Tasmanian Digger can also be used with a post puller. 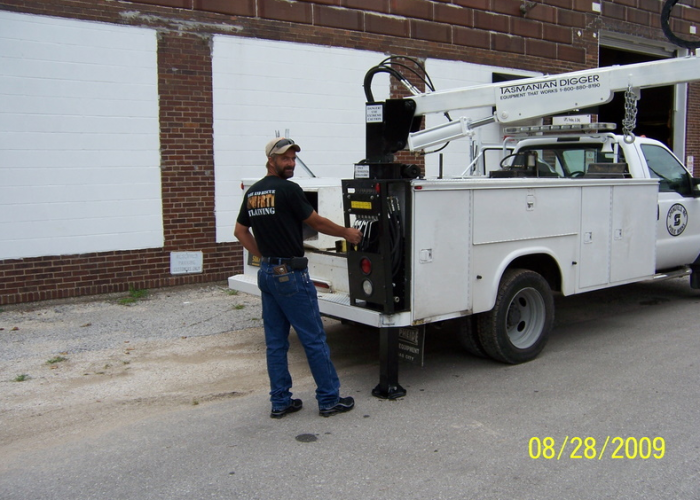 The puller features over 9,800 pounds of pulling force and has an 8” stroke. 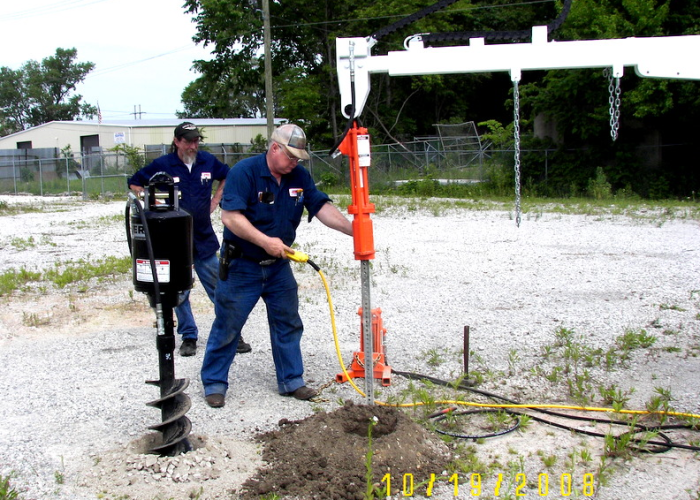 Posts up to 8” in diameter can be pulled effortlessly. 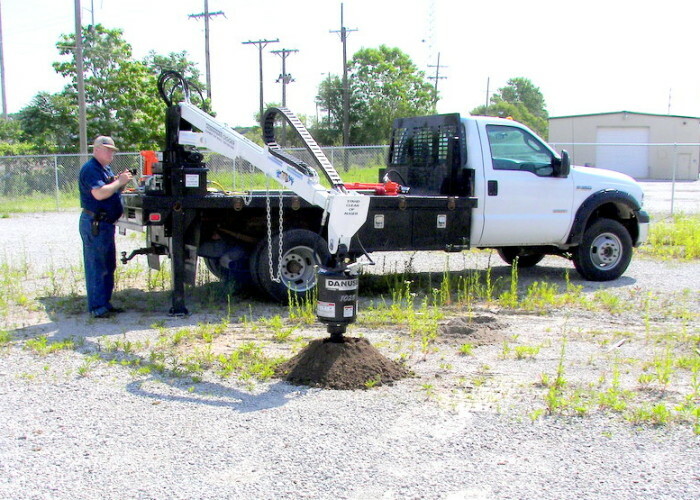 Truck Utility Mount - For mounting on a truck with a utility body, we offer two models. 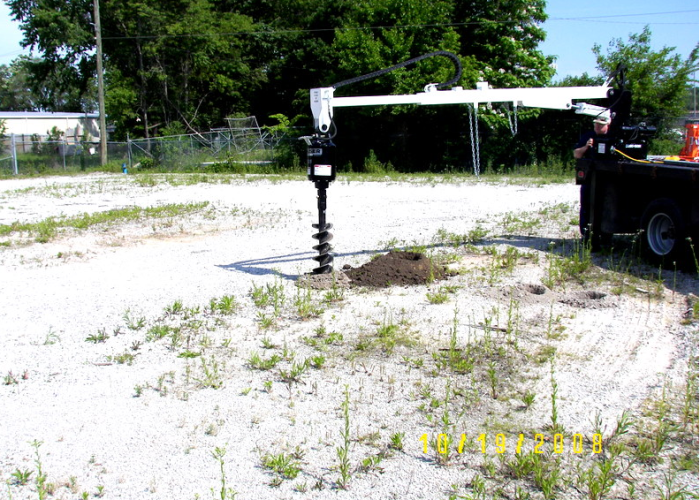 The first TASMANIAN DIGGER unit, model 9030 UM has an overall collapsed length of 8’-8” and a 30” telescoping inner boom allowing for a maximum length of 11’-0” from the center of rotation to the center of the auger. 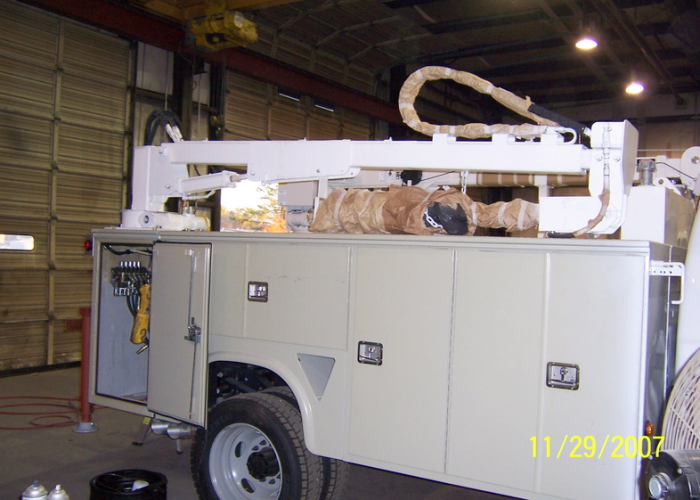 This unit would be mounted on a 9’-0” utility body. Hydraulic Tool Circuit - We also offer a hydraulic tool circuit that can be used with our post puller or with other hydraulic tools such as tampers, impact wrenches, saws, etc. 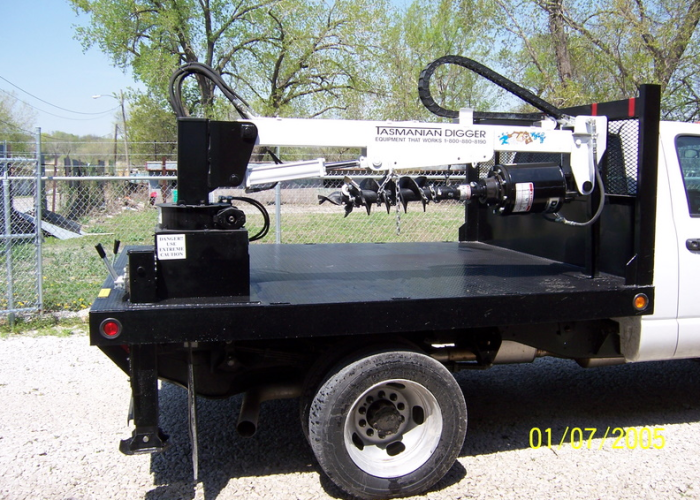 Single User Operated - The TASMANIAN DIGGER unit is a truck or trailer mounted, hydraulically operated boom type unit that is used to either DRILL holes for posts or signs using a hydraulically driven auger or to DRIVE various types of steel posts using a hydraulically operated post driver. 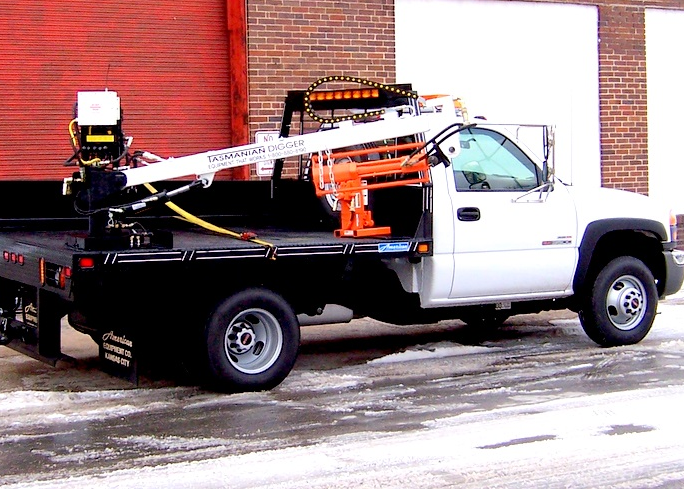 Flat Bed Mounted - The boom can be raised and lowered, rotated and extended from one location at the rear curbside, all with hydraulics and variable controls. We have a model that fits on a 10’ truck bed or one for a 12’ truck bed. 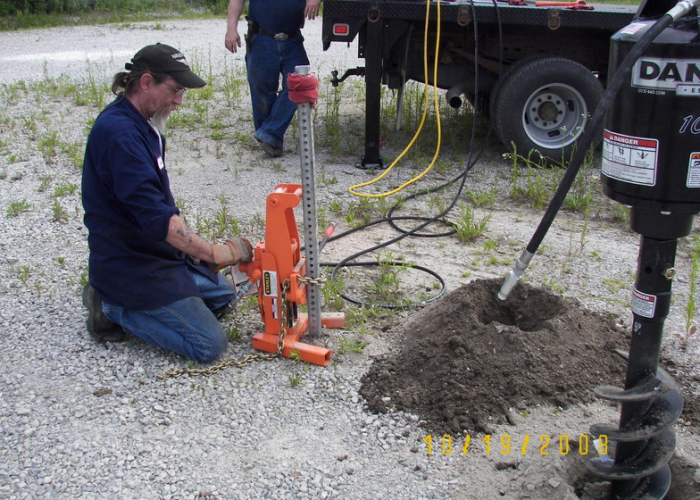 Tasmanian Digger - We also offer a hydraulic tool circuit that can be used with our post puller or with other hydraulic tools such as tampers, impact wrenches, saws, etc.